Wonderful Lake Anna Pet Friendly home on the shores of Lake Anna Woods. This home is 450 feet from the water front, and sleeps 6 people max. There are 3 comfortable bedrooms; queen bedroom 1, queen bedroom 2, with single bunk beds in bedroom 3. There is 1 large TV in the living room, then an additional TV in the den/mbr. Great for a family getaway close to Wash DC and Richmond Va. This Home is situated on the Public (Cold) Side of Lake Anna. There are 2 mature wooded acres, so you will have a lot of privacy. Lake Anna Woods is located in a Beautiful Cove on Pigeon Run, thereby less boat traffic and more fun for you. We Love to travel and have fun with Friends and Family. We enjoy all outdoor activity and choose Lake Anna as our Summer home away from Key West. 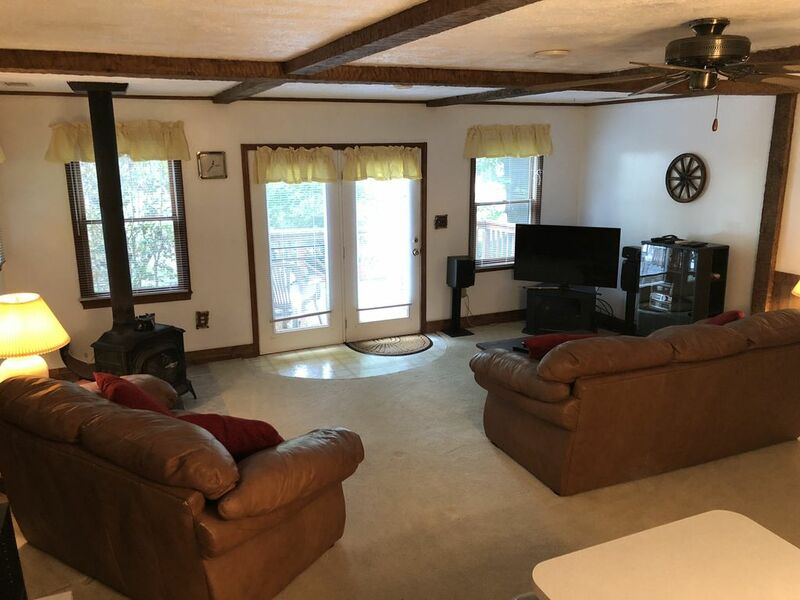 Beautiful Lake Cabin in the Majestic Lake Anna Woods community, Great for a monthly, weekly or a long weekend getaway... Perfect property to enjoy the Lake during the day and have terrific privacy at night. Awesome Fresh water retreat on 18000 acres of Lake. What else could you ask for? Come visit and enjoy Beautiful Lake Anna. Swimming, Boating, Fishing, Sunsets, Hiking, Biking, It is all right here at your fingertips. Bring your own Movies or Watch ours ! Community Boat Ramp and Dock... Bring your own Boat ! Leave the Hustle and Bustle of the City and come visit Beautiful Lake Anna... Dip your toes into this 18000 acre Fresh Water Lake. The Jewel of Virginia, conveniently located in the Center of Washington DC, Richmond VA and Charlottsville VA and easily reachable in an Hour from each... Come visit Beautiful Lake Anna amnd see just what you've been missing ! Super clean great place in the woods. Super quiet and relaxing. Great place, everything you need to have a pleasurable stay. No internet but it was a great break from the world! Thank you for a very relaxing Labor Day Weekend. The house is spotless and well equipped. Brian has done a good job of providing pretty much everything you need except food. The nearby Food Lion took care of everything else. We loved the quiet of his wooded property, yet easy access to Lake Anna. We spend a lot of time at Lake Anna during the summer, but always make it a day trip. We decided to spend a long weekend and started searching online for places to rent. We are so glad we found Brian's place. It was not only a great location in a wooded area, it also allowed us to dock our boat. We had easy access to the boat ramp, everything we needed in the kitchen for cooking, a grill so we could barbeque and we were even able to make an evening campfire in the pit. We would highly recommend this rental and look forward to returning in the future. Brian was also very helpful in answering our questions we had prior to renting. Thanks for an awesome weekend at Lake Anna! Yes, we are home and want to reply to your e-mail inquiry about our stay. A. First - Brian -- I am curious about your familiarity with Whispering Pines (door stop in bedroom) and Chincoteague coffee mug. This perked my interest as my mother (Elizabeth Mason) and distant relatives are from the surrounding areas. My mother retired in 1976 and built her retirement home in Accomac across from the library, on a hill next to a pond. She called it Willowbrook; later in late 1990's she moved to Onancock, a rambler on the creek. I remember many trips to the area, eating at "The Owl" and driving to get the best fried chicken at Tammy and Johnny's - if I remember that business name correctly. She is now buried with many of her relatives in Pungateague . B. We enjoyed our stay and would most likely inquire about a future rental. It was nice to walk to the lake, the kids able to swim and fishing. Lou helped them catch/release some nice large bass. Several were 15-17 inches log. C. You asked for our feedback and have identified the following issues that were outstanding for us. 1. When we sent our reservation request for 2 adults;3 children, we received a confirmation "OK" with an initial price; however, when the bill was sent, there was an additional $40 charge for a 3rd child...why the discrepancy? 2. We could not identify any written information as to access of internet and wireless? 3. The lighting and table lamp fixtures in all the bedrooms was extremely poor and can be improved upon. 4. The master bath tub does not drain and you are standing in several inches of water as you shower. 5. Washing machine is on its last leg and there was concern it might even break down/leak during our stay. 6. Front door lock system is not worth the hassle for renters and would recommend being replaced. 7. Master bedroom mattress was too soft for us. 8. The second TV in the bunk bed room is very mediocre and should not be considered a good TV for web ad. This property was excellent and Brian made the paperwork process and arrival so smooth! Very convenient location on the lake, and peaceful neighborhood with friendly neighbors! I would recommend booking this place and will strongly consider booking again for our annual Lake Anna trip. Thanks again Brian! Very nice property, surroundings not what I wanted. The house was very well equipped, the only thing we didn't find was a baking sheet. But lots of dishes, cups, glasses, knives and cooking utensils, plus towels galore. Much appreciated. Brian was also very accommodating in letting us stay an extra two hours to see a World Cup game before heading out! My disappointment had more to do with the location (I expected it to be ON the water: it is not), no internet or T-mobile coverage, and amenities having nothing to do with Brian: there is no beach, the water is very murky and much too warm (my first and probably last visit to Lake Anna), and beaches altogether are very few and far between and crowded: we could not even get in to Lake Anna Park on July 4. I should emphasize that Brian is a very affable and generous host. Lake Anna is the second largest fresh-water inland lake in Virginia, with over 250 miles of shoreline and some 13,000 surface acres of water. Lake Anna has become Central Virginia's premier choice for water sports and fishing. Initially known as a vacation community, the number of full time residents has grown steadily since the lake was created in 1972. Lake Anna offers swimming, sailing, boating, world-class fishing, and multiple annual triathlons. Surrounding attractions include vineyards, antique shopping, golf, historic sites, theme parks, and hiking. To get the most out of the lake, one can rent a boat from various local marinas and businesses. Sailboat enthusiasts will prefer the more open, wide water appeal of the southern end of the lake (note: the lake's several bridges, including the main 208 bridge, are too low for a sailboat to pass beneath). Water sports junkies tend to enjoy the mid-lake area, while the fishing crowd has lots of hot spots in nooks and crannies of the northern 'on Golden pond' end. Anglers fish for over 30 species of fish including large mouth bass, striped bass, walleye, catfish, crappie, bluegill and white and yellow perch. Weekly fishing leagues keep our full time and local residents happy while sanctioned tournaments bring visiting anglers from afar. Lake Anna is very conveniently located. Washington, DC is only about an hour and a half away. It's only about 30 minutes to Fredericksburg where the Virginia Railway Express runs daily to Washington, DC. And, a drive of less than an hour will also get you to Richmond or Charlottesville. If you haven't yet been to this wonderful place, it's time that you visit us. And, if you already have, we KNOW you'll come back. $99.00 PER NIGHT RATE IS BASED ON A 7+ NIGHT MINIMUM STAY. STAY 14 NIGHTS AND GET 1 NIGHT FREE - PETS ADDITIONAL All Rates are subject to change up until Reservation is accepted. Rates Change Seasonally, for special events and for Holidays.